The fifth Guru, Shri Guru Arjan Dev Ji, was bestowed upon with the "Divine Light" by Guru Ramdas Ji in 1581. Guru Arjan Dev Ji was bom at Goindwal Sahib on the 15th April 1563. Guru Arjan was a saint and scholar of the highest quality and repute. He learnt Gurmukhi Script, Gurbani, Persian, Hindi and Sanskrit languages from Baba Budha Ji. Guru Arjan Dev Ji was sweet, humble and a perfect blend of devotion and sacrifice, he was hardly 18 years old when his father Guru Ram Das Ji installed him as the fifth Guru. 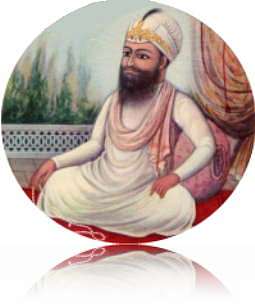 He compiled the hymns and compositions of Guru Nanak and his other predecessors, selected the sacred scriptures of some Hindu and Muslim saints, composed his own hymns and thus compiled the Adi Granth. After collecting the hymns of the first four Gurus, Hindu and Muslim Saints, Guru Arjan Dev Ji compiled the Guru Granth Sahib Ji which was written by Bhai Gurdas Ji. Guru Arjan Dev Ji contributed about 2000 verses themselves, and installed it at Harmandir Sahib in 1604 with Baba Budha Ji as the first Granthi. He proved that holy beings of whatever caste or creed are equally worthy of respect and reverence. Guru Arjan Dev Ji completed the work on two sacred tanks (sarowars) Santokshar and Amritsar. he then requested a Muslim Saint Hazrat Mian Mir of Lahore to lay the foundation stone of Harmandir Sahib in December 1588. Amritsar became the central institution where all the Sikhs used to gather, the tradition of Daswandh and the Masand system were also institutionalized. Guru Arjan Dev Ji founded the town of Tarn Taran Sahib near Goindwal Sahib and created a Gurudwara and sarowar there. They also built homes for lepers, laid the foundation stone of Kartarpur town, as well as establishing a town called Hargobindpur near the river Bias and sunk a big well for irrigation at Chheharta. After the death of Emperor Akbar in 1605 Hindu and Muslim fundamentalists influenced the new emperor Jahangir against the Sikh community and Guru Arjan Dev Ji. Many baseless allegations were levelled at Guru Arjan Dev Ji and he was arrested and brought to Lahore. They claimed that Guru Arjan Dev Ji were guilty of being implicated in these false cases and so sentenced them to death. The governor of Lahore tortured Guru Arjan Dev Ji for 3 days in a manner unknown in the history of mankind. Once the body had become blistered they were chained and thrown into the river Ravi on 30 May 1606. The Guru suffered quietly and bravely and set to the whole world an unequaled example of self-sacrifice and peaceful sufferings. Despite being made to sit in boiling water, and on a red hot iron plate while burning sand was poured over his body, he chanted cheerfully and softly "Sweet is Thy Will, My Lord; Thy grace alone I Beseech". He breathed his last in 1606.